Matty and I bought a bright green rug for our apartment. My favorite thing about it is that it looks just like grass. We rarely get to see grass in the city! and I can work and have picnics at the very same time! Who wants to bring the sandwiches? I had to click the last photo just to get a better look at those cookies. Mmm! Looks so nice and funny! love it, I got grass on my wall! Thats amazing! I love your apartment! It's like an adventure land! love your nails and Moo being a grazing cow! I was at an arts show this weekend, and I found a trail of big hippie flowers stuck to the road leading to an alley off the way where there were a few hidden booths. For a moment, I thought it was you, but the artist at the end of the trail, was selling raccoon traps. Welcome to Mississippi, and to my disappointment. What a perfect way to have picnic on a rainy day! I'm so jealous! I love how it looks so real, looks great to picnic on! i need one of these, living in arizona we never see green green grass! it looks so comfy cozy! That's pretty awesome. :] It's such a vibrant color and it looks so comfy. oooo I love the idea of picnic's at home! I might have to make a fort out of blankets to go with it! That's a pretty awesome rug. Hahaha child not included!! I'll make cupcakes !! Oh how fun! Maybe I need one of those during the winter months! Ok, now i think im your big fan! your blog and work rules totally! I am planning to buy a rug and totally buying one like yours. Thank you for always making my day brighter. congrats on your patch of green :) its like a little bit of a park in your place. omg, i love that!! can you please tell me where you got it?? Can I have one of those cookies? I will bring hummus and sprout sandwhichs! I'll bring the sandwiches, anything you want in particular? the picnic looks lovely. and moo looks right at home. i love it. Your pictures are always so beautiful! Love your blog, it makes me happy. I love the rug !!! I'd like to buy one for my flat and pretend I am lazing around in the park. Totally love it. What kind of cookies are those?? Today I saw your blog for the first time. I've been feeling bluhh for a couple of days, but I read every single post on your blog and I'm so full with energy and happiness! 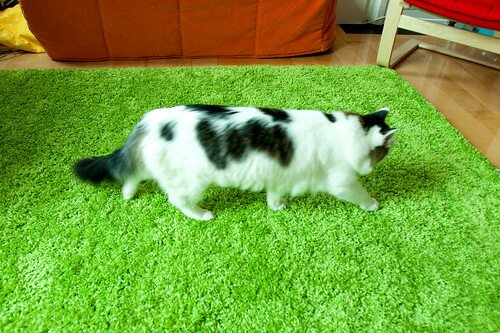 i love bright green shag carpets for this very reason! WOW so green!!! i liked... its greait!!! The rug is great. I am actually looking for the same rug for my soon to be baby's room. Can you tell me where you got it from? So fun, they just looked like a big green patch of grass! Love the shade of green, love your laptop too, actually I'm behind her sister right now ;). Recently I found your Flickr page and your work is incredibly inspiring! I have this same rug between my sofas! I love it, and I totally don't mind with the dog leaves her pink toys all over it, makes for great color contrast. Ahhh. Grass is awesome. 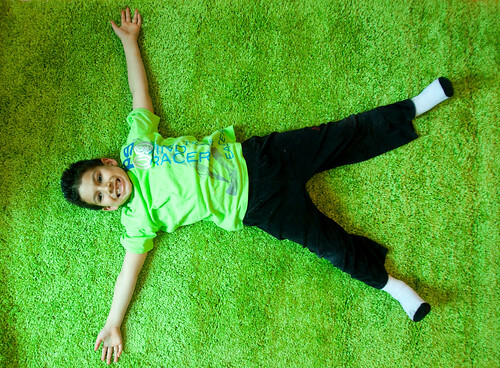 Carpet that looks like grass is awesome-er! I NEED THIS RUG! I need some color in our rental apartment! I want wall to wall of this carpet! I totally love that rug! It's like having a park right in your living room! YTour blog is so absolutely, astoundingly terrific. Thank you thank you thank you for sharing your good energy! Where did you find this! It's pretty awesome! oh no. Beware of Moo now, green rug turn him into a cow that can fly. Where did you get this rug? I'm about to move and I'd love to take some grass with me! i love these photos. what a neat idea! If you got it at Ikea, we have the same one! And it is perfect to picnic on! Hey! Could you release the recipe of those cookies? They look so yummy. Also, could you tell us your secret about getting them that exact perfect level of done-ness? Because yours look ideal. You're adorable, by the way. I Love the rug. I've been looking for one for about 5 months now! I wanted it for my travel themed room. It's perfect! I would love to have one of that. What brand of toenail polish? I love the rug! But the toenail polish really completes the room. i have the rug!!! =] mine's from ikea!! Hee, we bought the same rug for the same reason... love bringing the outdoors in! Love your indoor "yard" :) & it looks like Moo does too! Where'd you find the rug? I need a burst of color around here. i was catching up on your blog when my 4 year old, on glancing over said, 'can i see that picture of the cow?' about the picture of Moo walking on the new rug. Kids get it, ya know? I love all of your dresses! Where did you get them? 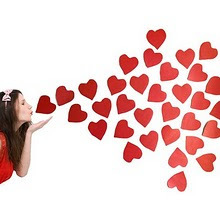 Love your blog.. I have that tray too and I recently spotted it on the Portlandia put a bird on it sketch as well, hah! I love this rug! Thanks for posting. Could you please tell me where you bought it or what brand? Thanks so much!